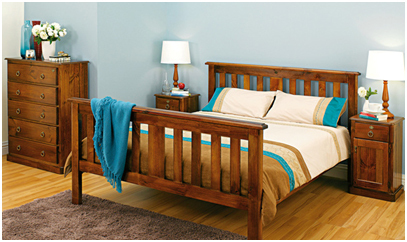 A beautiful Queen sized bedroom package with 4 pieces to convert your bedroom into the style you are looking for. This package includes a Queen bed but no mattress, 2 bedside tables and a 5 drawer tallboy. Each piece is made from maple coloured pine with the dressers and tables having stylish metal accents to allow the room to have a country or city feel.